Hotel de Carnavalet was originally built in 1548-60 on commission by the president of the Parlement of Paris, Jacques de Ligneris. The name Carnavalet comes from its second owner, whose real name was Kernevenoy or Kernevenoch. The street front on Rue de Sevigné was rebuilt by the architect Francois Mansart in 1655-61, after the financier Claude Boisleve took over ownership of the house in 1654. Mansart incorporated the original entrance arch by building over and around it. The sculpted figures on the ground floor represent force and vigilance and are by the Flemish 17th-century sculptor Gerard van Opstal. Among his most famous work were three sculptures that were added to the now-demolished city gate Porte Sainte-Antoine, which was built in the 16th century and also featured sculpture by Jean Goujon. The low relief above the balcony on the corner of Rue des Francs Bourgeois is also by Opstal. The rusticated entrance arch is from about 1550 and is commonly attributed to Pierre Lescot, though this is disputed. Rusticated arches, inspired by Italian models, had already been built at Fontainebleau - at Grotte des Pins or Hotel de Ferrare - but is here much smoother in texture. The relief work seems to be from the same period, except the figure on the keystone, which was likely added after the house passed to Kernevenoy. The figure represents abundance and stands on top of a carnival mask, presumably as a pun on the name Carnavalet. The single storey entrance arch was originally flanked by two pavilions of equal appearance; including a mezzanine, pitched roofs and dormer windows. Walking through the arch, the visitor arrives to a courtyard, which was also rebuilt by Mansart in the 17th century but still retains some of the original features. This applies primarily to the main block, which in French is typically referred to as the corps de logis. It includes four relief sculptures by Jean Goujon from the mid-16th century. The figures are allegorical representations of the four seasons. The involvement by Goujon may be one of the reasons why the house has been associated with Pierre Lescot, as the sculptor and amateur architect famously collaborated on the Louvre. The corps de logis was restored by Victor Parmentier in 1866-70. This included the return to mullion and transom windows, though not the original dimensions. The balustrades and dormers were based on an engraving from around 1650 but this may not have been how it was actually built. Parmentier also replaced the 17th-century mansard with a new and steeply sloped roof, and removed some decorate medallions that had been added to the ground floor. 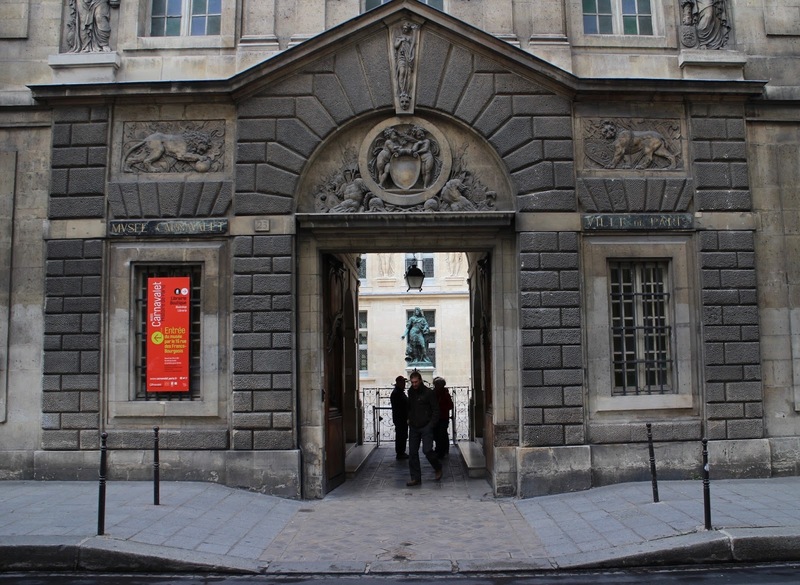 The wing on the left was originally just a single-storey gallery, which screened off the courtyard from Rue des Francs Bourgeois. The second storey was added by Mansart, who also built a completely new wing on the opposite side where there formerly had been stables. The relief work by Opstal is in imitation of Goujon's originals and represent the elements on left and divinities on the right. The bronze statue of Louis XIV was placed in the courtyard in 1890. It was first made in 1689 by Antoine Coysevox and previously stood in the courtyard of the city hall. The original features of the garden front (right) is not known but may have included some kind of rustication. The section to the left was built by architects Felix Roguet and Joseph-Antoine Bouvard after 1871. It includes a pavilion, which originally belonged to Hotel Desmarets, a building by an unknown architect from 1710. Elements of several buildings slated for demolition were added during this period, as Hotel Carnavalet had been bought by the city of Paris in 1866 and turned into a museum. This includes a frontispiece of the merchant draper's guild from 1660 by Jacques Brand. The archway on Rue des Francs Bourgeois was part of the Palais de la Cité and had been built in in 1552-56 by Guillaume le Breton. It is known as the Arc de Nazareth and spanned across the Rue de Nazareth, a street on Ile de la Cité which disappeared in 1883. The Hotel de Salm was originally built in 1782-88 by architect Pierre Rousseau for the prince of Salm-Kyrburg. It has been the headquarters of the Legion of Honour since 1804. The current building is a replica of the original, which was destroyed in a fire during the Paris Commune in 1871. The complex had been expanded in 1866-70 and was again in 1922-25. The entrance to the courtyard is a triumphal arch within a screen of Ionic columns. It is very similar to an unexecuted design by Marie-Joseph Peyre, which was presented in 1763 for the Hotel de Condé. The prince of Condé later moved to the Palais-Bourbon and his old residence was replaced with a theatre for the Comedie-Francaise. This theatre has been known since 1797 as Theatre de l'Odeon. Incidentally, the Scottish architect Robert Adam had previously used a screen of columns for the London Admiralty in 1759. The courtyard is thought to be inspired by Jacques Gondoin's School of Surgery from 1769-74. The portico has six Corinthian columns that fronts a relatively bare wall. It is decorated above the door with a frieze of garlands and a relief by Jean Guillaume Moitte depicting the Roman Festival of Pales, or Parilia. The former garden front overlooks the river and features a domed rotunda, capped with statues of Olympian gods and goddesses by Jean Guillaume Moitte. Rousseau also hired his brother-in-law Philippe-Laurent Roland, who designed the low relief on the pavilions of the entrance front on Rue de Lille. Both sculptors were later involved in the decoration of the Lemercier wing of the Louvre courtyard during the reign of Napoleon. The oval salon and planning of the rooms have been compared to the Hotel Thelusson by Claude-Nicolas Ledoux.